The Sapta rishi सप्तर्षि) are the seven rishis who are commended several times in the Vedas and Hindu literature for their tremendous contributions to the world. They are also called Manasputtra (sons born by thinking) of the creator Brahma. They possess immortal position and they live for one Manvantar (306,720,000 years on earth) using their extra ordinary yogmaya power. They serve as the representatives of Brahma. All the seven sages are endowed with the position of Brahmarshi;the highest title of a sage. Their place is much higher than celestial Gods (Devatas) since they are self - complacent and endowed with the knowledge of The Supreme Brahm. They are not bound by the rules of birth and death. After each Manvantar (see Kaal-time) they are replaced with new rishi of same caliber and the previous ones merge into the being of Brahma. 1. Atri (अत्रि): He is son of Brahma. Sage Atri is honored as the great discoverer of sacred Mantras. He is the author of two scriptures Atri Samhita and Atri Smriti. He is a great ascetic, who wanted to have the trinity (Brahma, Vishnu and Shankar) as his sons. He performed great penance in Kula Mountains to have Brahma, Vishnu and Shankar as his sons. His penance created a lot of heat, which set the whole world on fire. The Trinity were pleased by his devotion and took birth as his sons named Dattatreya, Chandraartri and Krishnantri. His wife was Anusuiya, who was universally famous for chastity and fidelity towards her husband. 2. Gautam (गौतम​): Rishi Gautam was one among of the Saptarhṣi in the Vedic Era. He is famous for his discovery of Sanskrit hymns of the Vedas. He was the son of Rahugana. He was married to Ahilya and had two sons Vamdev and Nodhas. The Rig and Sama Vedic Mantras are authored by Sage Gautama. He was one of the earliest writers on Law. He also authored Gautama Dharma Sutra His sons were also famous discoverers of the Ved – Mantras. Ramayan (Treta Yuga) and Mahabharatha (Dwapara Yuga) have references to Sage Gautam as he lived during these two Yugas. He is the progenitor of the Gautama gotra. 3. Jamdagni - Sage Jamdagni (जमदग्नि) was born in a respectable dynasty of Saint Bhrigu in seventh (current) Manvantar. He is famous for his talents and devotion. Sage Jamdagni was born to sage Richika and Satyawati. Jamdagni has five sons including the most famous one named Parashuram, the sixth incarnation of Lord Vishnu. Jamdagni was an excellent scholar of the scriptures and art ofr weaponry. During his time the earth was ruled by the most tyrant and unreligious dynasty of Haihayas, Kartavirya Arjun, a treacherous king of Haihayas dynasty, approached Jamdagni and forced him to hand over his kaamdhenu (a wish fulfilling celestial cow). Jamdagni refused to do so. Then, the treacherous king forcibly brought the Kamdhenu to his kingdom. Parashuram, the son of Jamdagni was outraged at this act covetousness. He killed Karavirya Arjun to punish Karavirya Arjun for transgressing his powers as a ruler. Later, three sons of the king killed Jamdagni, father of Parashurama, to avenge their father’s death. They first stabbed Jamdagni twenty-one times and then chopped off his head and departed with the chopped off head. Again enraged, Parashurama killed all the three brothers and retrieved the head of his father for cremation, and ultimately enacted a genocide on the kshatriya (warrior class according to Vedas) caste throughout the world for the next twenty-one generations since his father was stabbed by kshatriya twenty-one times. 4. Kashyap (कश्यप​) – Kashyapa is the son of Marichi and grandson of Brahma. He was the father of Devas, Asuras, Nagas, Garudas, Vamana, Agni, Adityas, Daityas, Aryaman, Mitra, Pusan, Varuna and all humanity. He was author of Kashyap Samhita which is classical reference book in field of Ayurvedic Pediatric, Gynecology, and Obstetrics. 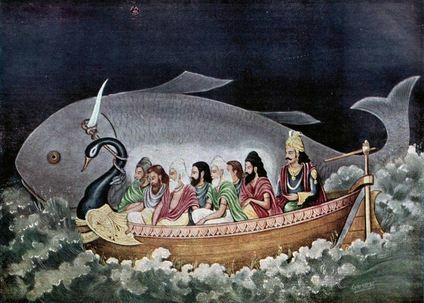 In the story of King Parikshit, before serpent Takshaka approached the king to bite, Kashyapa arrives to stop it. Takshaka challenges him by biting a tree and turning it into ashes. Kashyapa restored the tree with his yogic powers and defeats the serpent. However, Takshaka narrated the story of how Parikshit had been cursed by a Brahmin boy and the curse has to come to fruition. Kashyap understood the inevitability of king’s death. He accepted reverential offerings from Takshaka and left the place. Soon, he realized that it was not right for the Brahmin boy to curse such a god king. So he went to Tirupathi and atone for his sin. 5. Bharadvaja (भारद्वाज): He is one of the greatest sage in Vedic times and also descendant of sage Angirasa. His father is Devarshi Brihaspati. Sage Bharadvaja is author of Ayurveda. He is the father of Guru Dronacharya. He was a master of advanced military arts, including the Devastras, weaponry of devi-devatas. His wife is Susheela. He had a daughter named Devavarnini and son Garga. Dronacharya was also the Guru of Pandavas and Kauravas. According to some of the Puranas, Bharadvaja is found on banks of river Ganga and adopted by king Bharat. He had an unquenchable thirst for knowledge of Vedas and in addition meditated for Indra, Lord Shiva and Parvathi for more Vedic Knowledge. 6. Rishi Vashistha (वशिष्ठ): He is one of the famous sapt rishis of present Mavantar and is glorified in Rig Veda. He was created by Brahma to bring forth spiritual knowledge to the mankind to awaken them from the sleep of ignorance. He is the author of Vashishta Samhitha and astrology. He asked Brahma the reason of being entrapped by Maya and the method to be released from it. Brahma delivered spiritual knowledge to his son Vashishtha with an instruction to pass on this knowledge to the world. He was married to Arundhati. He was the Raj Guru of Suryavansh, the family in which Lord Ram was had descended. Vashishtha was the spiritual master of Lord Ram and Lakchhaman. 7. Vishvamitra (विश्वामित्र​): He was very famous amongst the seven sages for he was the founder of Gayattri Mantra of Rigveda, samved and Yajurveda. As per spiritual law, one cannot accomplish the position of Brahmarshi on his own merit, yet sage Vishwamittra is an example, who attained this distinguished denomination on his own merit. He wanted to attain the highest position as a sage. In order to attain the status he engaged in battles with Sage Vashishtha, but always lost at the hands of Vashishtha. This continuous defeat greatly disappointed him, to the extent that he decided to kill sage Vashishtha. As he was hiding behind Vashishtha’s cottage, he heard that sage Vashishtha, praising him. His arch rival prising him behind his back! The greatness of Vashishtha overwhelmed him and he surrendered to Vashishtha. Sage Vashishtha pardoned him. It inspired Vishwamitra to worship God. After austerity of thousands of years Brahma with the consent of Sage Vashishtha as well, conferred the title of Brahmarshi upon him.